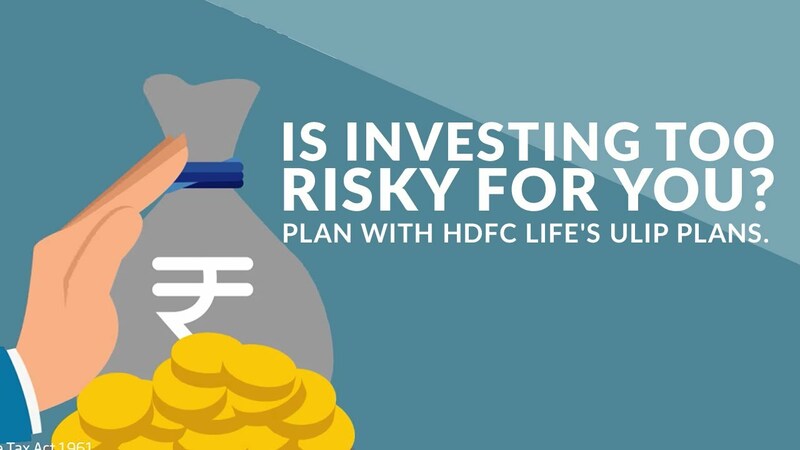 HDFC Life Click2Invest - ULIP is a online Unit linked plan in India that offers you market linked returns,charges you minimally, provides your family with valuable financial protection and best meets your investment needs. Meet your investments needs while providing your family with valuable financial protection with ULIP. HDFC Life Click2Invest - ULIP is an online Unit Linked Plan in India that offers you market linked returns. 1Subject to provisions as per Income Tax Act, 1961. Tax Laws are subject to change. What are the charges applicable for this plan? 5. Mortality Charge: The amount of the charge taken each month depends on your age and level of cover. In addition, only if you request for partial withdrawal, fund switch and premium redirection a charge of Rs 250 per request or a reduced charge of Rs 25 per request (if executed through the company's web portal) will be charged. First 4 partial withdrawals, 4 fund switches and 4 premium redirections in a policy year are free. Why is this plan good for me? What are the various fund options in this plan? Where do I check the fund performance? What do I get at the end of the policy term? At the end of your policy term i.e. at maturity, you will receive your Fund Value. For how many years can I stay invested in this plan? You can choose a policy term of 5 years to 20 years under this plan. What will my family receive in case of my unfortunate demise? 3. 105% of the premium(s) paid. Can I terminate my policy? You can surrender you policy subject to a lock in period of 5 years. No discontinuance charge is charged in this policy. Please refer to product brochure for more details on discontinuance of premiums and surrender of policy. Can I do a partial withdraw from my fund? Under settlement option, you can also take your fund value at maturity in periodical installments. What is the limited mode of premium pay? A limited premium payment policy requires you to pay premiums for a term lesser than your policy term. You can buy more than one policy subject to successful underwriting. Are there medicals involved to buy this plan? Yes. The list of medical tests required is on case to case basis. How is the Fund Value calculated? Fund Value will be calculated by multiplying balance units in your fund by the then prevailing NAV price. What is the minimum premium that needs to be paid? I am a NRI. Can I Invest in this plan? NRIs can invest in this plan by filling a mandatory NRI questionnaire. What is the frequency in which I can invest my money? There is no limit on maximum amount that you can invest in this plan, subject to underwriting. How is this plan different from other ULIPs? Is there any protection cover in this plan? Yes you can surrender your policy. Once you surrender your policy, your risk cover will cease and surrender benefit will be paid out depending upon the year in which the policy is surrendered. Please refer to product brochure for more details. Most of the life goals, such as buying a house, child's higher education and wedding, your retirement and so on, require savings over a long time, as the sum involved is substantial. With less time at hand, your ability to absorb losses from higher risk investment reduces, as you don't have time to recoup losses. If you invest Rs 10,000 per month for 10 years, your money grows to Rs 18.12 lakh at 8 per cent return per annum. Many a times, when people assess their risk appetite, they end up looking only at the gains or the upside, and don't factor in what they can lose out on the returns or principal, in the interim. When you are facing constraints on regular savings, you would like your money to grow more. This shouldn't be mistaken for a greater risk appetite for you. On the contrary, lower savings amounts should make you more prudent and could make you decide to settle for slightly lower-risk investments. Even when people are aware about the possible losses in an investment, they tend to overestimate their threshold to tolerate losses, even if they are short-term and notional in nature for long term investment. Even when you have alternative savings to fall back upon to fulfill your goal, if your designated investment suffers a loss, you could end up putting other needs at risk. For instance, assume that you are saving aggressively for your child's higher studies and your retirement. You fall short of the amount to meet your child's requirements as some of your investments don't grow well and make losses in the previous years. You might then be tempted to withdraw money from the retirement savings. This would endanger your retired living. You may or may not want to take up risks beyond at a certain level depending on the purpose of the investment. Nearer the proximity of the goal, people prefer taking up lesser risk. For instance, if you are saving for your home down payment in 3-4 years, equity investments will be inappropriate due to short-term market turbulence and the fact that they typically work for period of 8-10 years or more. Another mistake many people make is not differentiating between loss aversion (avoid losing money) and risk aversion (unpredictable returns). Most people prefer a higher degree of predictability in the return on their investments, which makes them go for conservative products which offer low, but fixed and predictable returns. But, by investing in them, especially for long term needs, you actually end up losing, thanks to inflation devouring the purchasing power of savings. On the other hand, loss aversion can be managed by managing the risks in investments better. This could be done in many ways including making investments in different asset classes be it equity, debt or gold so that some developments affecting some assets and investments don't impact all your investments. Even within the same asset class like equities, the investments can be spread over lower to higher risk alternatives like large and mid-cap funds. A common oversight of investors is to overlook the time when they would need the money that they are now investing. If you know that you might need a part or whole of the savings at a particular point of time, then your investments need to allow you access to money at the time of your need. For instance, if you are investing for your child's higher education where you need the money in 18 years, a 20-year investment will be inappropriate if it doesn't allow you to withdraw the money when you need it. While considering such an investment, you need to ask whether you manage the risk of your money to coming to you at the anticipated time of requirement. Many a times, changes in tax structures and regulatory changes can also have a deep impact on the returns of your investments. That's why it is not a great idea to make an investment solely or largely based on the tax treatment. Remember, new taxes could be introduced and existing ones modified. This is a risk that needs to be factored in. This could disturb all your return calculations, and other aspects such as exit from the investments. One aspect where ULIPs score over mutual funds, except ELSS, is the deduction from income of the investment amount of up to Rs 1.5 lakh under Section 80C. This effectively adds to the return from your ULIP funds. So, if you utilise this deduction limit annually, you can save tax up to Rs 46,350/- every year. This savings is effectively directed to the goal for which the ULIP is earmarked, such as retirement. Barring ELSS and retirement mutual funds, no other mutual fund investment provides this benefit. At the same time, there are many other benefits of ULIPs not related to taxation that help them score over these investments. Even of the tax front, there is a crucial area where ULIPs score over ELSS. This holds true for those investing in high to moderate equity investment ULIP funds for their long term goals. If you have invested in equities through mutual funds, then you might want to de-risk your corpus a few years before reaching your goal, so that both your capital and gains are preserved. This is typically done in a lower risk investment such as debt mutual fund. However, just in case you need the money before 3 years, the entire capital gains gets added to your income and is taxed at the rate applicable to you. For instance, let's assume that you have saved Rs 20 lakh in an equity fund over the years. Suppose you transfer the money to a debt fund two years before the money is needed. If the debt fund provides 8% returns annually, on liquidating the investment, you need to pay income tax of Rs 99,840 due to short-term capital gains, if you are in the highest tax bracket of 30%. This is because capital gains made before completion of three years in a debt mutual fund is treated as short term capital gains. Things might be a little better if you stay invested for more than three years in the debt mutual fund as you will have to pay 20% long term capital gains tax with inflation indexation benefit for the cost of acquisition of the units. Now, compare this experience with ULIPs. A switch to ULIP debt fund or any other fund would be tax-free since the maturity amount is tax free under Section 10(10D) of the Income Tax Act, 1961 subject to conditions specified therein. ULIPs compete with many other growth investments alternatives such as mutual funds. 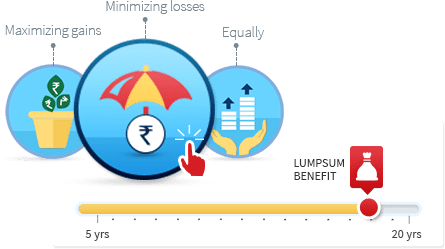 On matters related to taxation of investment, returns and redemption proceeds, it has some distinct advantages over mutual funds including the tax saving ELSS, especially when it comes to saving for specific needs. Investors would do well to make the most of them. The above mentioned tax benefits are subject to changes in the tax laws. The tax benefits described above reflect our understanding of the current legislations. It is advisable to re-confirm the same with your tax consultant at your end.